Did Chaucer Mention April Fool’s Day? The Nun's Priest's Tale in Chaucer's Canterbury Tales tells the story of a vain rooster, Chauntecleer, whose vanity leads him to drop his guard while showing off how splendidly he crows. As a result, he almost gets eaten by a fox. But Chauntecleer outwits the fox that carries him away in its mouth by taking advantage of the fox's own vanity. 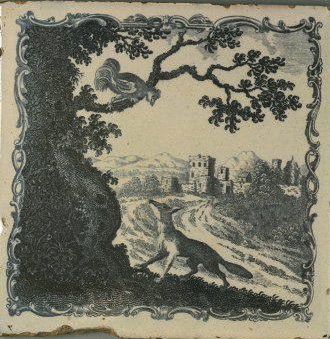 He persuades the fox to stop and mock his pursuers. As soon as the fox opens its mouth to do so, Chauntecleer flies to safety up into a tree. The story is one of the most popular of Chaucer's tales, because of its playful humor involving talking barnyard animals, much like a Disney cartoon. But in recent years the story has acquired a different claim-to-fame, on account of an assertion that's circulated widely online stating that the tale contains a reference to April Fool's Day. Chaucer wrote The Canterbury Tales in the late 14th Century, so if the reference to April Fool's Day checks out, it would be the first time the celebration was mentioned in any language. In fact, it would predate any other reference by about 170 years, thereby offering strong evidence that April Fool's Day originated in England. But does the reference check out? Did Chaucer actually mention April Fool's Day? One way of reading this (and, as we shall see, not the only possible way) is that it's a roundabout, repetitive way of saying the story takes place on April 1, because this is the day you arrive at a) when March is complete, and b) when 32 days (thritty days and two) have passed since March began (i.e., April 1 = March 32). However, it's also possible these lines indicate a date of April 2. After all, if 32 days have passed since March began, that would land us on the 2nd, not the 1st. The precise meaning is ambiguous. Taketh the moralitee, good men. A lot of people have concluded that Chaucer did set the Nun's Priest's Tale on April 1, and that he intended this as an allusion to April Fool's Day. Wikipedia, for instance, cites the tale as "the earliest recorded association between 1 April and foolishness," although it concedes that the reference is "ambiguous." Unfortunately, the issue isn't that simple, because most Chaucer scholars do not believe the tale is set on April 1 or 2. Instead, the majority of them (almost all) believe the tale is set on May 3. That it was prime; and crew with blissful stevene. In this passage, we're given some astronomical information. Or rather, astrological infomation. In Chaucer's time the two were one and the same. 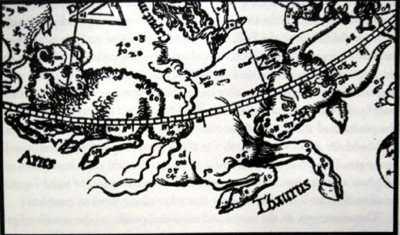 The narrator tells us that on the day the tale takes place the sun had run 21 degrees "and somewhat more" in the sign of Taurus. These details point us to a very specific date. The language of astrology is still popular enough that most people are aware that the signs of the Zodiac (Aries, Taurus, Gemini, etc.) refer to times of the year. So if you're born between March 20 and April 20, you're an Aries; April 20 to May 21, you're a Taurus; May 21 to June 21, a Gemini; etc. The tradition of dividing the year into 12 equal periods, each assigned to a different Zodiac sign, dates back several thousand years to when ancient astronomers divided the annual path of the sun across the heavens (the ecliptic) into twelve equal parts, 30 degrees each. These astronomers named each division after the constellation that, at that time of year, was visible in the night sky nearest to the path of the ecliptic. The signs of the zodiac encircling the earth. 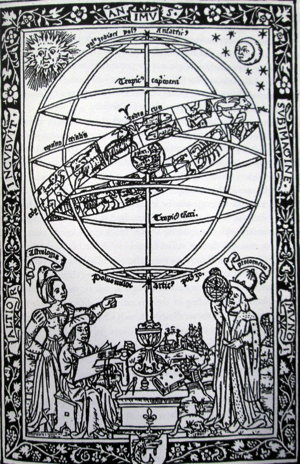 A woodcut in the Astronomicum Caesarem of Peter Apianus (1540). Nowadays the springtime vernal equinox occurs around March 20. So the Zodiac year begins with Aries on that day. However, in Chaucer's time, because of the Julian calendar, the vernal equinox fell on March 12, setting the zodiac calendar 12 days back from our perspective. So for Chaucer the sign of Taurus began on April 12. But he tells us that the sun had run 21 degrees "and somewhat more" in the sign of Taurus. If one day corresponds approximately to one degree, and if we count 21 days and 'somewhat more' from April 12, we arrive at May 3. Or possibly, May 2. But most scholars reckon it's May 3. And that's why these scholars believe that The Nun's Priest's Tale is set on May 3. As it turns out, the third of May crops up a number of times in Chaucer's work. The Knight's Tale is also set on that day (in the seventhe yer, of May / The thridde nyght". And in his work Troilus and Criseyde, the character Pandare is afflicted by love sickness "on Mayes day the thrydde". May 3 is mentioned so often by Chaucer that scholars have taken to referring to it as his "favorite date". Why did he like that day so much? John McCall, author of "Chaucer Among the Gods," has theorized it was because May 3, in Roman times, was the concluding day of the six-day Festival of Flora, the "ministress of Venus." It was a day to celebrate and be moved by carnal desires. So Chaucer may have felt it was a fitting day to portray the actions of characters moved by "the effects of irrational love or concupiscent desires." McCall notes that in the Nun's Priest's Tale Chaucer makes an association between May 3 and flowers (i.e. Flora) when, a few lines after the astrological information that points us to May 3, Chauntecleer praises the "freshe flowres, how they springe" and tells how his heart is full of "revel and solas" (revelry and grace). Full is mine hert of revel and solas! The take-home point here is that not only does Chaucer provide the reader with specific astronomical information that places The Nun's Priest's Tale on May 3, but also, when we consider Chaucer's entire body of work and how often he mentioned the third of May, it makes sense that he would set the Nun's Priest's Tale on his "favorite date." The theory that the Nun's Priest's Tale is set on May 3 has a lot going for it. In particular, it's hard to argue with the specific zodiac information that Chaucer provides. But how do we reconcile May 3 with those four earlier lines that seem to indicate April 1 or 2? One thing is for sure. It's impossible to fit April 1 into the sign of Taurus. So Chaucer seems to provide conflicting dates within the same sentence. Resolving this apparent paradox isn't easy. Derek Pearsall, editor of the Variorum edition of The Canterbury Tales, adds a footnote after the phrase "and passed were also / Syn March bigan" noting that, "The method of computing the date here has caused scribes and editors a good deal of trouble." He then proceeds, for the next two-and-a-half pages written in small print, to elaborate on the long history of editorial angst caused by this passage. The strategy employed by most editors has been to assume that because both dates can't be correct, one of them has to be wrong. And then they decide that since the reference to the sun being in the sign of Taurus is unambiguous, the earlier phrase, about 32 days having passed since March began, must be a mistake — perhaps a typo made by a medieval scribe given the job of copying Chaucer's work. Going with the mistake theory, many modern editions of Chaucer replace the phrase "Syn March began" with "Syn March was gon," assuming that this (or something like it) must have been what Chaucer either originally wrote, or intended to write. This resolves all the difficulties, because if we count 32 days from the end of March, we arrive at May 3rd. "The date, May 3, is playfully denoted by saying that March was complete and also (since March began) thirty-two days more had passed. The words 'since March began' are parenthetical; and we are, in fact, told that the whole of March, the whole of April, and two days of May were done with." The historian Peter Travis has suggested a third possibility. He argues that Chaucer didn't intend to provide a precise date at all, but instead purposefully used confusing language in order to parody the language of Medieval philosophy. In late Medieval England, a genre of logic problems known as "incipit/desinit" problems had become popular. Hundreds of examples of them can be found. These problems always took a similar form. They posited a beginning condition (incipit, it begins) as well as an ending condition (desinit, it ceases) and challenged the reader to use logic to understand the condition of the subject at the instant of change. The popularity of these incipit/desinit problems grew out of the Medieval scholastic interest in motion, change, and limits. Assume that Socrates is now one foot tall, Plato two feet tall; and let each of them grow uniformly throughout the next hour, Socrates twice as fast as Plato, stipulating further that three feet is the smallest size that neither of them will have, since both cease to exist at the end of the hour at which moment both would have been three feet tall had they then existed. In the passage from the Nun's Priest's Tale that begins with "When that the monthe," we find the same language of beginning, ceasing, and passage of time ("monthe in which the world bigan… Was complet, and passed were also / Syn March bigan"). Travis argues that Chaucer's contemporaries would have recognized this as the language of an incipit/desinit problem. However, whereas Medieval philosophers considered such problems to be extremely serious matters, Chaucer poked fun at them by placing his mock puzzle in a tale about talking barnyard animals. "time and again students discovered that a final and correct answer had been thwarted or immobilized by a logical impasse... the unresolvable sophism is designed to force the reader into further and deeper rumination both upon linguistic and logical issues at hand, as well as upon phenomenological matters dealing with beginnings, endings, motion, change, and time." It is irresolution, paradox, ambiguity, and confusion that are the most important consequences of the heuristic strategies of Chaucer's brilliant incipit/desinit sophism. It is very doubtful, therefore, that Chaucer ever expected his careful reader to determine the sophism's "right" day — April 1 or April 2 — and it is just as doubtful that Chauver ever expected that date to be successfully harmonized with the later date the remainder of the chronographia points toward — May 2 or May 3. In other words, if we accept Travis's argument, the Nun's Priest's Tale isn't set on any specific date at all. From all the above, it should be clear that it's problematic to claim that The Nun's Priest Tale takes place on April 1. It's far more likely the tale is set on May 3. Or perhaps on no date. But for the sake of argument, let's assume that Chaucer did intend for The Nun's Priest's Tale to be set on April 1. What would be the significance of this? Could we really assume this was a reference to April Fool's Day? That would be quite a stretch of logic, to put it charitably. The reason it would be such a stretch is that all other evidence suggests that the tradition of April Foolery most likely originated in Holland and Germany during the sixteenth century, and that the celebration only made its way to England in the late seventeenth century. For instance, the earliest explicit reference to April Fool's Day is found in a Dutch poem published in 1561. It refers to April 1 as "Fool's errand day." 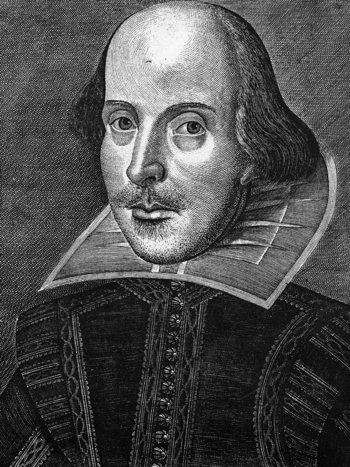 Shakespeare, who photographs all the customs of his time with strict fidelity, nowhere mentions April Fools, although he delights in fools in general; there can be little doubt that had the custom existed, Shakespeare would have somewhere alluded to it. It's not until the second half of the 17th century that we come across the first English-language references to April Fool's Day. In Francis Osborne's "Deductions from the History of the Earl of Essex," written around 1659, we find mention of "impertinent errands, as the Dutch youth do [put upon] fools on the second of April"
And John Aubrey, in his Remains of Gentilism and Judaism published in 1686, included the following note: "Fooles holy day. We observe it on ye first of April. And so it is kept in Germany everywhere." Both these writers associated the tradition of April Fool's Day with foreign countries (Netherlands and Germany). And Osborne didn't even seem very familiar with the tradition, given that he placed it on the second, not the first. So if English writers of the late seventeenth century weren't very familiar with April Fool's Day (and they thought it was a foreign custom), how could we possibly conclude that Chaucer, writing almost 300 years before, was familiar with an April 1 tradition? That wouldn't make much sense, especially given the extreme vagueness of Chaucer's reference. Remember that he didn't mention April Fool's Day itself, only April 1. And actually, he probably didn't even do that. To make a long story short: No, Chaucer didn't mention April Fool's Day. My guess is that the claim that he did probably got started when some English literature students noticed the possible April 1 reference in the Nun's Priest's Tale, and because they were familiar with April Fool's Day, they assumed Chaucer must have been also. And so the claim started to circulate online. But it's a claim that dissolves upon investigation. So, sorry England. It looks like you were not the birthplace of April Fool's Day. Dickens, Charles, Jr. (1869). "All Fools' Day." The Gentleman's Magazine: 543-548. Osborn, Marijane. (2002). Time and the Astrolabe in The Canterbury Tales. University of Oklahoma Press. Pearsall, Derek. (1984). 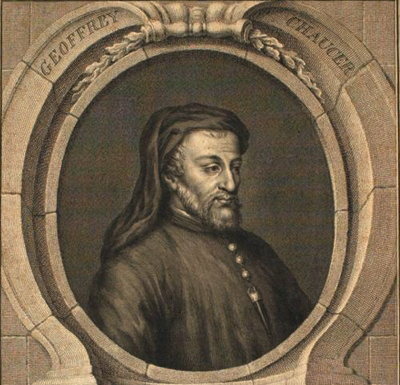 The Nun's Priest's Tale: A Variorum Edition of The Works of Geoffrey Chaucer. University of Oklahoma Press. Travis, Peter. (1997). "Chaucer's Chronographiae, the Confounded Reader, and Fourteenth-Century Measurements of Time." in Constructions of Time in the Late Middle Ages. Poster, C. & Utz, R.J. (eds.) Northwestern University Press: 1-34.